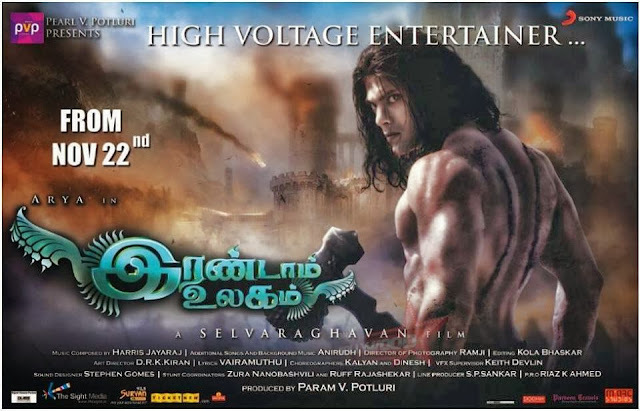 Irandam Ulagam released world wide over 1200 screens in Tamil and Telugu versions. Irandam Ulagam says that Love is everywhere. It is here and in the unseen worlds. The thought of love itself is beautiful and Selvaraghavan's latest movie Irandam Ulagam takes it to the next level. But let me warn you that it is an esoteric work that could be a trap for regular audience! Having said that it has an alluring magic of visuals that will enchant you. Irandam Ulagam has two separate worlds and it is about the stories that unfold in a parallel universe. Selvaraghavan narrates the two tales with eye-pleasing visuals. Ramya (Anusha Shetty) has a liking towards Madhu Balakrishnan (Arya), but he initially refuses her offer for marriage. But in the dream world, Arya tries to woo Anushka. The story keeps juggling between the love story of dream world and the tale set here, the place where we are living. After turning down Ramya's offer, Madhu falls in love with her and approaches her to marry her, but this time, she rejects his offer citing that she has found another man. How he tries to win her heart and change her stand form the crux of their story. In the other world, Arya struggles to impress Anushka, who is a tough woman. There is also a plot of two clans fighting over Amma (mother love). The story takes a little interesting turn when Arya, on Earth, meets the people of other world. The biggest drawback could be slow narration of the story in the first half. While the imaginary world raises curiosity, Selva's other plot struggles to keep you engaged. Second Better Than First Half The second half is better than the first half with the entire story running in the imaginary world. However, when we consider the movie as a whole, Selvaraghavan could have churned out a tight screenplay, as the pace/plots doesn't generate interest to watch the movie. Harris Jayaraj has teamed up with Selvaraghavan for the first time and the result is just brilliant! Four songs - 'En kaadhal thee', 'Mannavane en mannavaney', 'Vinnaithaandi anbe vandhai' and 'Panangkalla veshamulla' - are good in the album. Anirudh Ravichander's background score is average and he only shines at parts. Harris would have done a better job than this as he understood the concept of Irandam Ulagam. One would run short of words to describe Ramji's cinematography in Irandam Ulagam. Excellent piece of camera work, and VFX sequences, at parts, are wonderful.